Go Green 21Nov2010 - GGI-Group size: 4000+ Professionals, Increasing on day to day basis, Come & join us 2 serve Mother Nature. @ 7:00am, Totally 17 members Started from RIS junction and took our usual route and touched Kanteerva Stadium where, we were confused about the location due to a huge no of peoples who were participating in the dieabatic walkthone event. 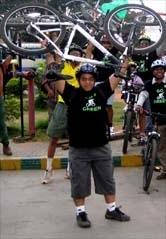 Totally 47 GGI participated in the Cycle Rally that was arranged by the transport commissioner along with The Transport department, RTO official, Karnataka Mountaineering Association, WANI & Go Green. 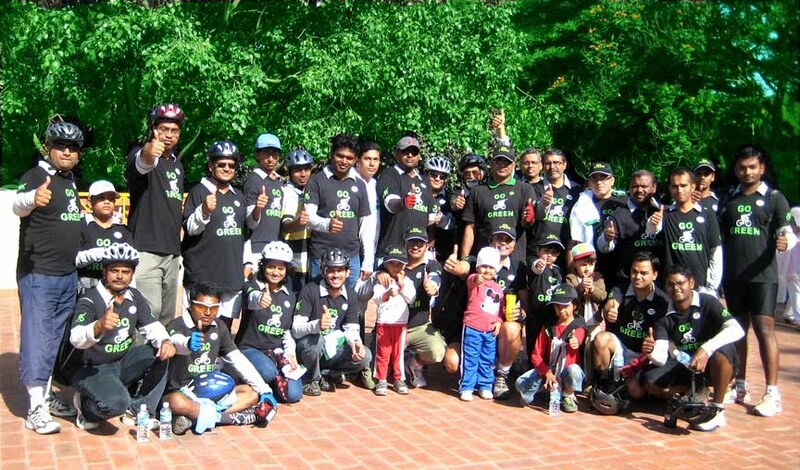 All these groups come together to participate in Go Green Cycle Rally. 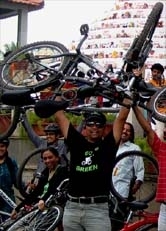 Transport Commissioner Mr. Bhaskar Rao along with Urban planning, development officer Manjula, Athlete Reet Abraham, GoGreen team where present in the Cycle rally. 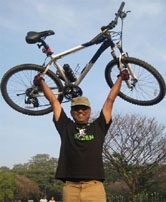 Reet Abraham flagged off the Cycle Rally @ 8:15am and the Rally went all along the Ulsoor lake & came back to Sports Authority of India by 9:20am. All together Totally 8 km distance was covered. RTO officials were very kind enough to support our cyclist who got into trouble while cycling & other officials who were standing in several places and helping the riders by providing them drinking water. We from GoGreen Team and other participants sincerely thank them. Following was the route covered. RIS/Coffee day junction -Jaynagar 4th Block - Jnagar 3rd block -Sount end Circle - Patalamma Temple St - Madhavarao Circle - Vasvi Temple Rd - Sajjan Rao Circle - Karanataka Auto Consultants - Minerva Circle - JC Road - Town Hall - Hudson Circle - Cubbon Park - KAsturaba Rd - Kanteerva Stadium. Kanteerva Stadium - Kasturba Rd- Queens Rd - Cubbon Rd- Dickanson Rd - Ulsoor Rd - Annaswamy Mudaliar Rd - all along Ulsoor Lake pathway - Kengiston Rd- Bhaskaran Rd - Gurdwar Rd - MG Rd- Kasturba Rd - Sports Authority of India head office.